The XXXVI Congress of the Brazilian Computer Society is being held at buildings 40 and 41 of the Pontifical Catholic University of Rio Grande do Sul (Porto Alegre Campus), in the week from 04th to 07th of July 2016. The GMAP team have attended the congress, with researcher Cleverson Ledur performing volunteering work in the Congress; also with the participation of GMAP coordinator Prof. Dr. Luiz Gustavo Leo Fernandes, researchers Dalvan Griebler and Lucas Piatnicki, highlighting the satellite event 1st Cloudscape Brazil. From left to right: M. Sc. 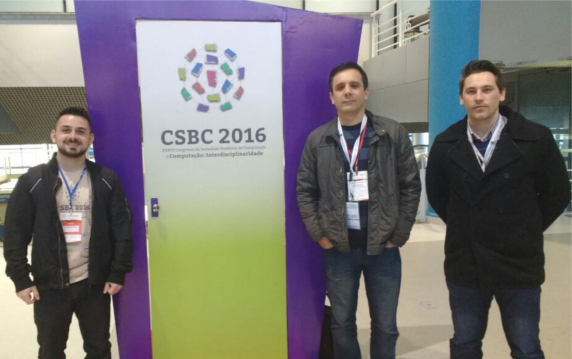 Cleverson Ledur, Prof. Dr. Luiz Gustavo Fernandes and Dr. Dalvan Griebler at XXXVI CSBC (PUCRS) .